Learning HTML shouldn't be as hard as you might think it is... All you need is the right teacher and the right environment. Forget about the books and scathing your head searching online for answers to questions you don't even know how to ask yet. 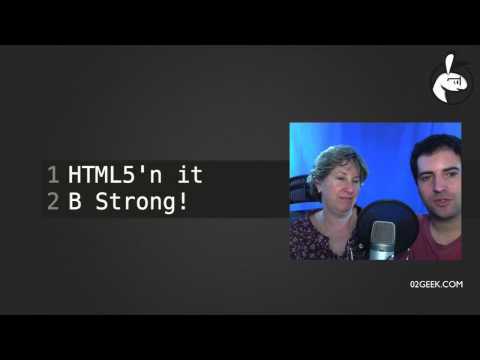 Join Ben's mom as he teaches her HTML. This is the easiest way into programing ever. This course isn't designed as a quick getting started course but designed as a easy intro into the world of programing. 02GEEK as Ben our lead instructor grabs his mom and teaches her live in-front of your eyes how to work in HTML. IF your totally new start from the first course in the cluster by visiting our HTML Training Category Page. In this third session we crack into HTML5. We learn how to define our pages as HTML5 pages. WE understand that tags have a meaning there not design elements but they have real meaning behind them. By the end of this session you will be very comfy working with the DOCTYPE, B and String Tags, the I and U tags, and Creating Lists using the UL,OL and IL Tags. Did you say I'm unordered? !